The leftwing media was all ready to film them… Coincidence? After a long 8 years of suicidal non-enforcement of our immigration laws, the pushback begins. Go ahead liberals & cry me a river! 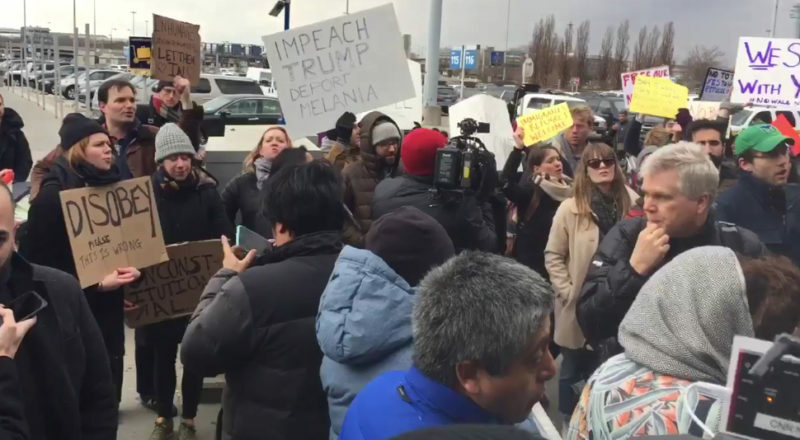 New York- Protests erupt at JFK’s terminal 4 on Saturday after incoming refugees were detained by customs and border patrol agents following Trump’s executive order temporarily banning refugees from 7 Muslim countries. The protesters were chanting “Say it loud, say it clear, refugees are welcome here! Strange, I never saw any protesters showing outrage after Americans were killed or injured by Islamic terrorists. The left cares more about the lives of non-Americans. They would rather be ‘politically correct’ than make the tough choices necessary to protect American citizens. It has been proven that ISIS and other terrorists are infiltrating Western countries through the refugee program, yet these protesters are demanding we still roll the dice and let them in. Unbelievable! The detainment comes just a day after President Donald Trump signed an executive order temporarily closing U.S. borders to refugees of Muslim-majority nations for 90 days, and for Syrian refugees, indefinitely.